Facing the most formidably concentrated air defences in history, pilots of the F-105D flew against North Vietnamese targets day after day during the 43 months of Operation Rolling Thunder. Despite its limited maneuverability and the lack of self-sealing fuel tanks, which made it susceptible to combat damage, the 'bombers' shot down 27 MiG fighters in 1966 67. 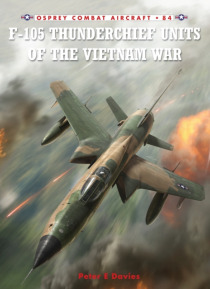 This book illustrates the importance… of the Thunderchief in the Rolling Thunder campaign, including the pioneering suppression of enemy air defences (SEAD) methods developed by the F-105 'Wild Weasel' crews. Discussing the aircraft's strengths and weaknesses and using first-hand narratives, Peter Davies captures the essence of flying the 'Thud' against heavy defences, and describes the development of wartime tactics and the heroic accomplishments of a selection of its aircrew.